The World Cup is down to four countries competing for the title: Brazil, Germany, Argentina and the Netherlands, and Africa has consistently tuned in to watch in astonishing numbers. Throughout the 2014 World Cup, GeoPoll’s Audience Measurement Service, which measures daily TV viewership through mobile surveys, has been running in Ghana, Nigeria, Kenya, Tanzania, and Uganda. The data we have received highlights Africa’s true love and passion for football. Below we will share some in-depth insights on team popularity, gender breakdown, and viewership in Africa compared to the US. It is no surprise that World Cup viewers polled in these five countries were most tuned in during games involving African nations, in particular Nigeria. When this West African team played, between 15 million and 25.1 million viewers were tuned in, with the highest viewership occurring during the first Nigeria game played, against Iran. The second most watched game also involved an African team, Ghana, when 24.5 million tuned in across the 5 countries to watch their loss to Germany. Although Africans were most tuned in for home teams, GeoPoll’s data demonstrates the popularity of several international teams, especially now that all African nations have been eliminated. Germany has had high viewership throughout, partly due to their strong standing in the tournament, and because they played two African teams: Ghana and Algeria. German games have drawn between 14.8 and 24.5 million adult viewers in Africa, for an average viewership of 20.5 million through the Round of 16. By comparison, the USA only had an average of 14.6 million viewers across their games. Brazil has also been a popular team to watch: 24.9 million tuned in to their match against Chile. 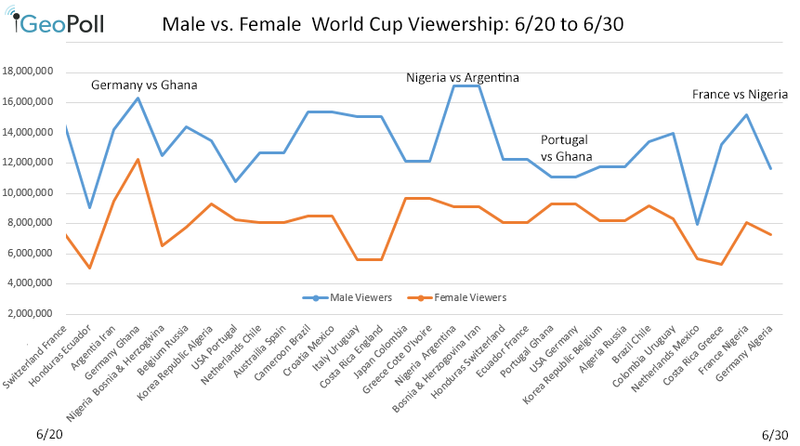 In general, we have found that more males are watching the games than females. Across all games and countries through the Round of 16, the gender split has been 67% male to 33% female. Female viewership has not exceeded a total of 10.5 million across all 5 countries, and no games had more female than male viewers, but we have seen some interesting patterns when examining what games females are most likely to watch. While males have consistently tuned in to games, females have tuned in most to games involving African teams. The four games with the highest female viewership numbers all involved African teams, and the highest female viewed game was Germany-Ghana, which drew 14.3 million males and 10.3 million females. Below is a chart showing the male/female breakdown from June 20th to June 30th. Click here for more gender details. Americans are slowly developing a love for football, or soccer, as it is known in the states. This World Cup has experienced record-breaking viewership numbers in the US. ESPN reported 16.9 million Americans watched the USA- Belgium game in the Round of 16, and even more tuned in for the USA-Portugal game: 18.2 million American’s saw USA tie the game 2-2. This has been reported as the most non-football viewed ESPN telecast, which is quite an achievement for soccer in the US. However, similarly to African viewers showing loyalty to their own nations, this record-breaking viewership has been most prominent for US games. Although the Brazil-Chile game was the highest rated non-US World Cup game ever recorded, it only drew 6.1 million US viewers. That’s just under 2% of the total US population. By comparison, about 7.7% of the total combined populations of Ghana, Kenya, Nigeria, Uganda, and Tanzania tuned in according to GeoPoll’s numbers, which do not measure children. American love for the sport is growing, but does not compare to the passion these African nations have demonstrated for the World Cup. As the final games are played, we will continue to measure viewership numbers, gender breakdowns, and more. So far, audience sizes have been impressive, and with only a few games left we imagine they will stay high. Although Africans have been loyal to their home teams, this quadrennial event has shown impressive audience sizes throughout, and with only a few games left we imagine they will remain high. Stay tuned for semi-final and final viewership numbers, and a summary of World Cup viewing once it’s all over!